It's Friday evening, the work week is over and the weekend has not started yet, the best time of the week. All week, I was thinking of cooking something special for Friday evening, but I haven't made up my mind till Friday morning, when I heard MM was going to stop by in the evening. That was it, I had to cook something that he would like and appreciate. A quick glance in the freezer, revealed a lonely rack of lamb, two packs of chicken breasts, and an organic turkey, that did not make it to the Thanksgiving feast. 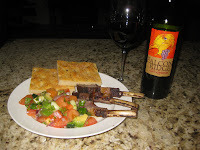 The lamb was not enough for a party, but perfect for my Friday dinner. 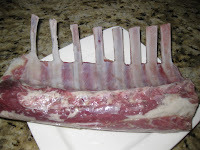 A "Shopska" salad on a side would be perfect with the lamb. What else ... aha, I needed some bread. At that point I did not have 16-24 hours to make a nice rustic bread, I wanted something that can be done faster. 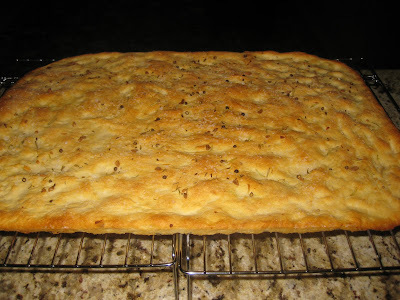 After some research, I found a good recipe for a potato focaccia, that required about three to four hours to be prepared. 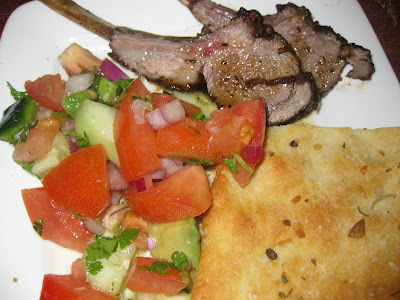 And there you go, I had a menu, a rack of lamb with shopska salad and focaccia bread. 1/2 cup extra-virgin olive oil. 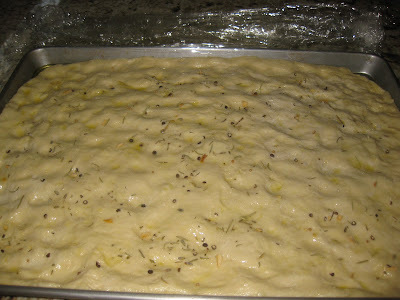 A high quality olive oil is a must have for the focaccia. STEP1: I boiled the potato till it was easily pierced, about 10-15 minutes. I saved the boiling water for the bread. 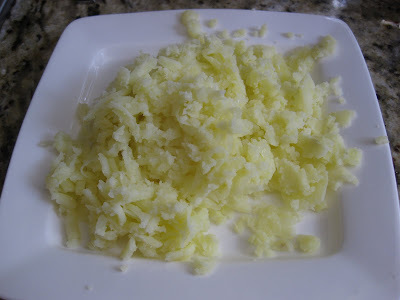 When the potato cooled enough to be handled, I grated the potato. STEP2: In a standing mixer, I mixed the potato, flour, 2 tbsp oil, yeast and table salt. With the mixer running on low speed I added 1 cup of the reserved potato water, cooled already to 110F. 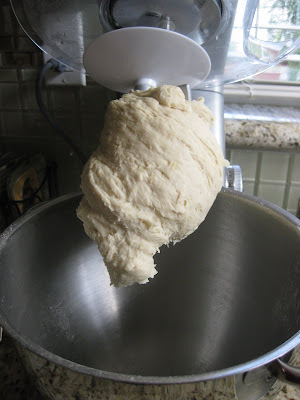 The mixer kneaded the dough for about 8 minutes. 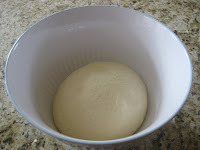 STEP 3: I made a smooth ball from the dough and placed it in a lightly greased bowl to rise for about 1 1/2 hours. STEP 4: Then I coated a baking sheet with 2 tbsp olive oil. 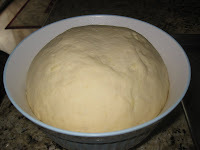 I pressed the dough with wet hands into the baking sheet and brushed it with olive oil. Left it to rise for 1 1/2 hour. STEP 5: When the dough has risen I dimpled the dough, with wet fingers, then drizzled with olive oil and sprinkled with the Provencal spices. Baked it in a 425 degree oven for 20-25 minutes, cooled it of on a wire rack. First, I washed the rack and dried it with paper towel. 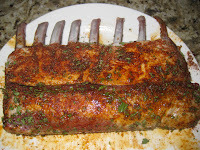 Then, I lightly oiled the lamb, mixed all the spices, and rubbed them to the lamb. Left it to rest for about half an hour. I preheated 1 tsp of oil in a heavy pan, and cooked over medium heat for approximately 8 minutes per side or until the internal temperature reach 160F. 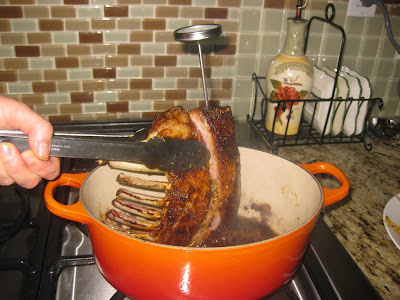 Then I turned of the heat but I kept the lamb in the pan with closed lid. It continued to cook and came out medium rare. I personally like it when it is rare, but most people prefer medium rare to done. Wow - you beat me to the punch! this was going to be next bread recipe to try! :) Mine did not rise enough, maybe because of the potatoes. It was very tasty, but wasn't moist enough inside. I'm sure you are going to do better! Everything is gone :(. You saw how much it was. We can make a roasted chicken, though :). We can try Julia Child's recipe. Lokuma you are so sweet! Did you see America's Test Kitchen has a new chicken recipe (in a Dutch oven). Btw did you get the same Dutch oven as mine? No, mine is smaller than yours. Don't you remember, we bought them together at TJMax.? Yes, that is the oval one.